Several area teens will attend prom in style, thanks in part to the generosity of students of St. Hubert Catholic High School for Girls. The Bambies have collected more than 60 gently used dresses for the third annual Prom Gear Exchange, which will take place on April 27 at Calvary Christian Church in Northeast Philadelphia. The exchange provides free attire and accessories to teens for whom prom costs are beyond the family budget. The event is sponsored by Catholic Community Services (CCS), an agency of archdiocesan Catholic Social Services (CSS) that supports families through an array of programs and initiatives. 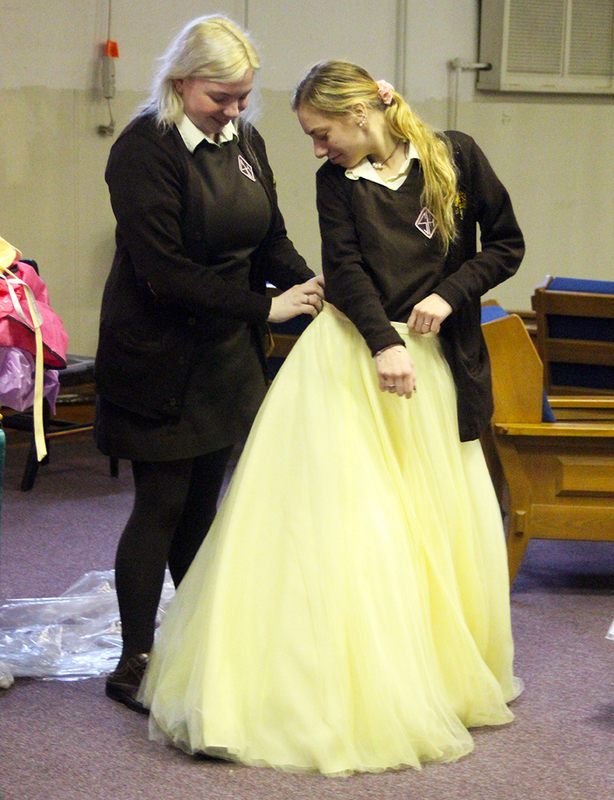 According to Patricia Dougherty, assistant principal for student services at St. Hubert’s, the dress drive is part of the school’s overall effort to partner more closely with CSS. The school dove into its new outreach feet first, collecting over 1,400 pairs of new socks for the nearby CSS center during Catholic Schools Week in late January and early February of this year. Dougherty then set aside a two-week period for the students to gather prom gowns. Ginger Smith, community liaison for CCS, launched Prom Gear Exchange as a way of helping area youth participate in what has been a teen tradition since the 1940s. The price tag of prom can be daunting, however, particularly for lower-income families. In recent years, average costs — which include attire, accessories and transportation — have ranged anywhere from $600 to more than $1,100, according to national surveys by Visa and Yahoo. For the 2019 season, Teen Vogue’s suggestions for affordable gowns start at $100. Smith recalled that the first exchange, which took place at St. Martin of Tours Parish, helped one couple who had never dreamed they could get to the dance. As word of the exchange has spread, the number of teens assisted has nearly doubled, from 20 in 2017 to almost 40 last year. Smith hopes to outfit at least 50 teens this year, while also providing them with valuable information on obtaining a driver’s license, interviewing for jobs and applying for scholarships. Students at St. Hubert’s were eager to help fellow teens enjoy a magical evening. “All our friends are at prom, and we get to dress up and see each other in a different light,” said junior Maddy Bolduc. Marykate Stine, a fellow junior, felt the gown drive was a worthy cause. “I thought it was a good idea, because people our age really don’t have that kind of money to spend,” said Stine, who predicted that off-the-shoulder mermaid dresses would be this season’s most popular style. While inspecting the donations, Dougherty reflected on how prom fashions have changed over the years. To learn more about the Prom Gear Exchange or to arrange a donation, drop off or pick up (accessories are particularly needed), contact Ginger Smith at 215-221-2010 or gismith@chs-adphila.org.